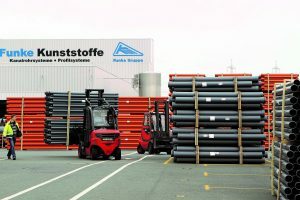 Funke Kunststoffe GmbH deals in the big pipes – to channel rainwater and sewerage. But they didn’t stop there. Working with its customers and their R&D team, they’ve applied their piping knowhow to other sectors including DIY-style home improvement. With the tree root aerator and GOLPLA floor mounting plate, Funke has expanded its portfolio to include professional gardening and landscaping products. In addition, Funke has developed its do-it-yourself line with gutter systems and lawn grid plates. The company’s extensive product range not only offers the well proven HS® and CONNEX sewer pipe systems, but also a wide range of molded and mounted parts; D-Raintank 3000® and D-Rainclean®. With flexible pipe couplings as well as an extensive assortment for the sewer connection area and property drainage, Funke offers systems “from the sewer connection to the collector”, which combine high quality with simple handling and long life span.